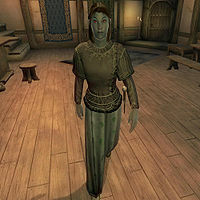 Glistel is a Dunmer agent living at Malintus Ancrus' house in Chorrol. You may hear many rumors from townspeople expressing their disgust at the relationship. It is possible, however, that this relationship is merely a front; they are in fact both Thieves Guild members, and the only representatives of the guild living in the city. She offers basic Sneak training. She wears upper-class clothing consisting of a highwayman's shirt, a green silk garment, and a pair of green velvet shoes. She is armed with an iron dagger and carries her key and a modest sum of gold. Glistel will introduce herself when first spoken to: "I'm Glistel. What do you need?" Asking her about the city will prompt her to talk about her housemate: "My housemate, Malintus Ancus [sic], and I are well-known in certain circles here. But, you don't travel in those circles, do you?" When asked about Chorrol, Malintus will provide a hint: "Glistel and me, we keep an eye on things here in Chorrol for certain interested parties... as a public service, like." The townspeople are quick to speak rumors about the situation between Glistel and Malintus: "I can't believe that Glistel would live with that Malintus Ancrus. Shameful, and her being such a lovely girl. ", "I don't understand what Glistel is doing with Malintus Ancrus. I mean, have you seen her? And have you seen him? I just don't get it. ", "I'm sure you've heard that Glistel and Malintus Ancrus are living together. Simply shameful." and "Have you seen Glistel and Malintus Ancrus together? Isn't it awful?" Others will reply: "It is awful. Her poor mother. What is Glistel thinking?" while some will be more forgiving: "I don't see a problem with those two. It's a bit odd, but that's their business." Esta página foi modificada pela última vez à(s) 06h07min de 20 de setembro de 2014.